Seago made many painting trips to Venice between the early 1930s and his final visit in 1960. The present work, showing the Fish Market near the Rialto Bridge on the Grand Canal, was later worked up into an oil painting of the same title (Private Collection; see F.W. Hawcroft, Edward Seago, A Review of the Years 1953-1954, London, 1965, pl. 48). 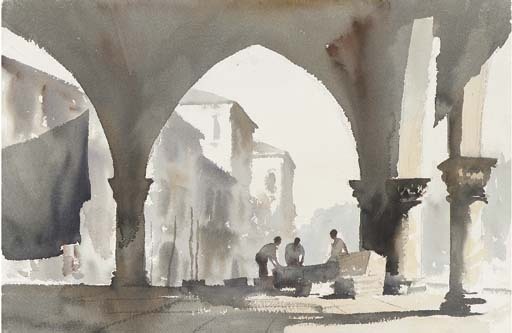 James Reid (Edward Seago, The Landscape Art, London, 1991, p. 199) comments that Seago particularly enjoyed painting the pointed arches and colonnades characteristic of Venetian architecture and that 'he found this to perfection in the Pescheria, or Fish Market, through whose high arches one glimpses the Palazzo Foscari across the Grand Canal, and underneath which he brushed in a group of people bunched together in a little knot'.